What If a Community Art Project Were Never Done? Last week, while in Atlanta for the Opportunity Finance Network conference, I caught a glimpse on a bus tour of the Krog Street Tunnel. 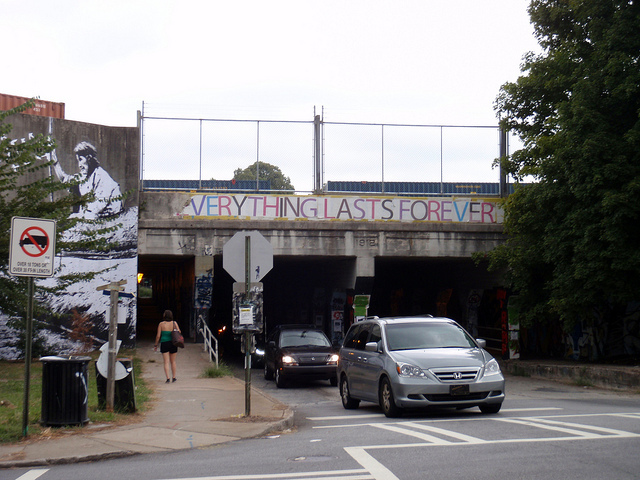 The narrow tunnel under a railroad track is covered in street art, which is constantly being painted over. On the walls around the entrance to the tunnel there were a number of painted announcements of upcoming local events, which reminded me of the rock monuments at Oberlin College that are regularly painted over with political messages or event promotions. All of these things reminded me of something that I’ve been trying to put words to since I visited the Power House Productions sites in Detroit last spring. PHP owns a handful of small, once single-family homes in a single-family neighborhood now known as Banglatown, named after the immigrants who have been energizing it recently. 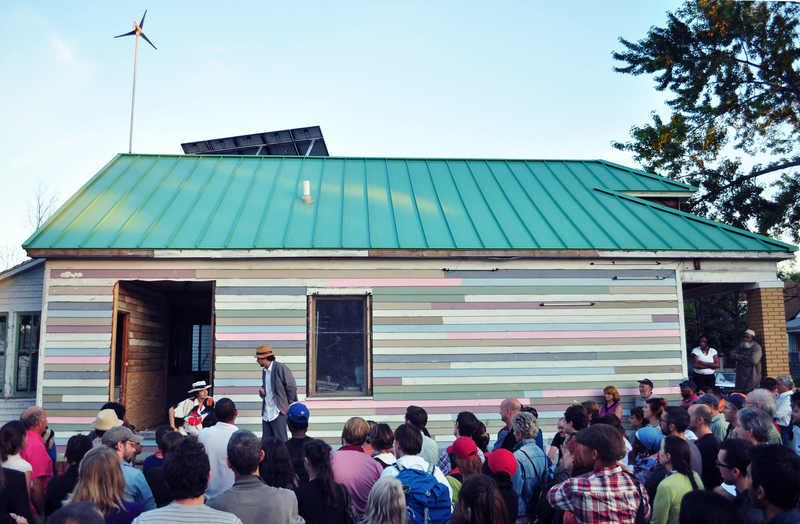 Of their projects, I got to see Play House, an intimate 2-story performance space; Jar House, which hosts a reading room/library of Afro-Futurism works; and the original “Power House,” an experiment in small-scale power production and sustainable rehab that is off the grid and generates its own wind and solar power. The Power House itself has been “under construction” for years, and it’s clearly not “done.” As of spring 2016, it still looked like a construction zone inside, and yet there was no sense of urgency or panic about a delay. The building is in use. The ongoing experimentation seems to be a lot of the point. The act of interacting with the building and exploring its possibilities is in some ways the art. This is very much a long-term community plan and presence, not a single art project, as co-founders told Model D Media in 2014. Similarly, but on a much smaller note, Jar House was beautiful, well-built, full of books and in use—even while touches like trim around the windows were totally unfinished. I remember thinking that a housing development would never get away with that (and probably shouldn’t). Physical art can be something that’s intended to be left unchanging once made, put in a museum, or otherwise considered complete. But art can also be very much about process. It can be iterative and repetitive and changing. It can be intentionally unfinished, with the viewer or participant bringing a final ingredient. It can be more like living in an old home than like building a new one. This kind of art is farther away from traditional real estate and housing development projects than a more traditional public-art-installation-with-a-single-artist-and-community-input-and-an-unveiling type of project. It raises many questions. How do you define success? How do you get the next grant if it’s hard to tell when the work you did with the first grant is “done”? What if someone adds a piece to the canvas that is challenging or inappropriate in some way? What will the building permit folks say? And yet it also has so much possibility—a vacant space that might not be financially viable to turn into housing could be a vibrant temporary or permanent location for artistic endeavor, whether as a studio, venue, or canvas. And something that’s always changing could provide a focus for ongoing community conversations and a sense of belonging. I’d love to hear of examples of community development organizations embracing this kind of art—not just donating a wall for a mural, but supporting some sort of canvas for an ever-evolving explosion of expression. Not only helping an arts nonprofit fully renovate an old theater or studio space, but also making space to let some artists do what they do within smaller buildings (within limits of safety)—such as adapt the space for photo shoots, shows, experimentation (what architect Stewart Brand would call “low road space”).